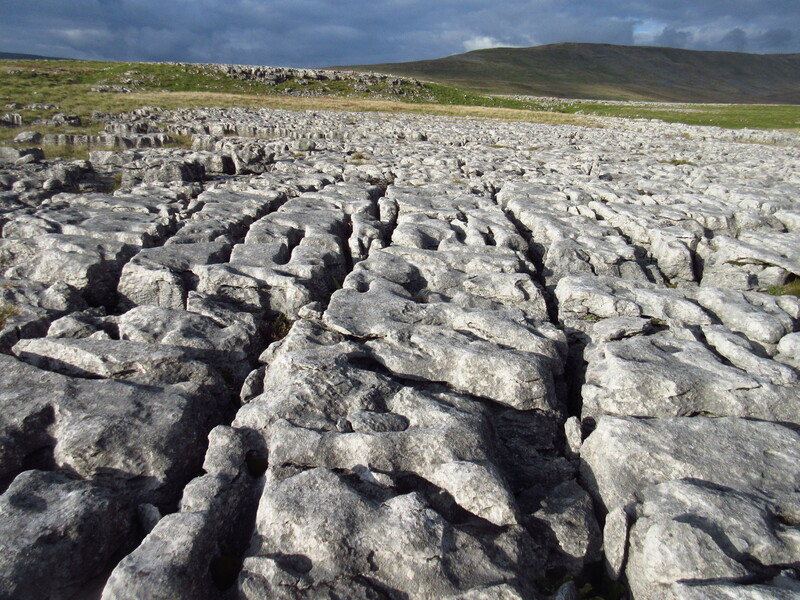 Limestone pavements are relatively scarce features in the British landscape, and Ingleborough has the finest of them all. The great pavements of Scar Close, Southerscales and White Scars, to the north and west of the main pyramid – are text book examples of world importance. Even ‘once only’ Three Peaks walkers, with the sole intention of reaching the summit, cannot fail to be awestruck by their stark beauty. It is easy to assume that they were swept clean by the glaciers of the Devensian, but their origins are much more complex, and are still hotly debated by geologists. The Devensian glaciers certainly did play a major role. 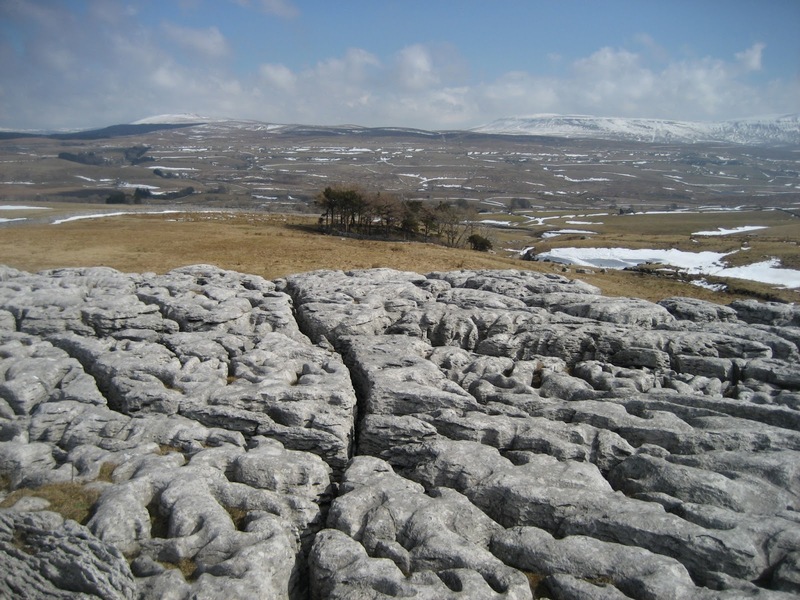 In scouring Chapel-le-Dale and Ribblesdale, the ice removed the weaker rocks above, leaving the strong bedding of Great Scar Limestone exposed at the surface. 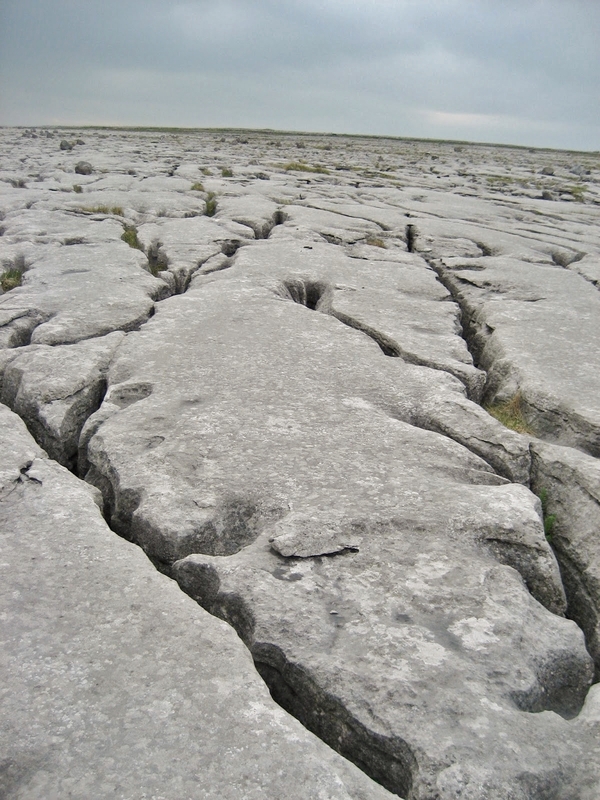 As the glaciers melted from around 16,000 years ago, a layer of drift was plastered over the limestone benches, added to by ‘loess’ – a mass of wind-blown silt typical of such climatic conditions, and this layer of covering soil was central to the formation of the famous pavement features. Water, passing through the soil and plant cover, absorbed carbon-dioxide and became a mild form of carbonic acid. 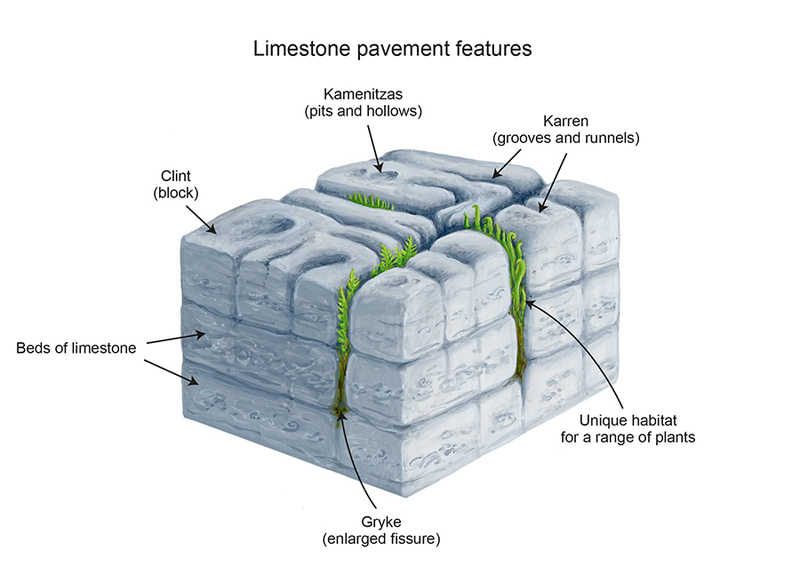 Its erosive powers worked on the soluble limestone along its many lines of weakness, or joints – widening them into the famous grykes and separating huge blocks or clints to form the familiar pavement structure. Knowing the rate at which limestone dissolves, and considering the depth of some of the grykes, it is assumed that many pavements date back to before the Devensian, but most geologists consider the majority of pavements we see today to be relatively recent features. Pavements vary in structure according to several factors. 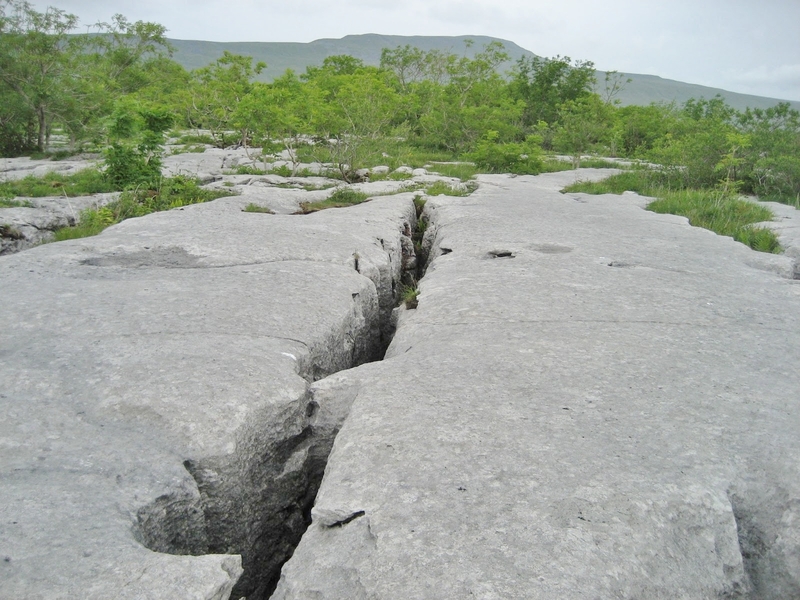 Those close to the Craven Faults were formed in limestone with many stress joints and so the resulting clints are small and well weathered, creating a chaotic and fragile appearance. These are well seen around Feizor, where the South Craven and Feizor faults have caused excessive jointing. At Scar Close, on the other hand, well away from the faults, joints are scarcer and the clints are massive, being several metres across. Scar Close, in fact, has not been grazed for many years and is an example of what a pavement might have looked like if it was allowed to develop naturally. There are still islands of soil cover with plant growth – but in general the main soil cover has receded, though not as rapidly as it would if aided by grazing. Erosion since the last glaciation has removed the layer of soil and till to expose the pavements along Chapel-le-Dale and Scales Moor. Most of the soil was probably washed into the grykes themselves, but there are still many covered pavements whose familiar structure can be detected under grass cover. 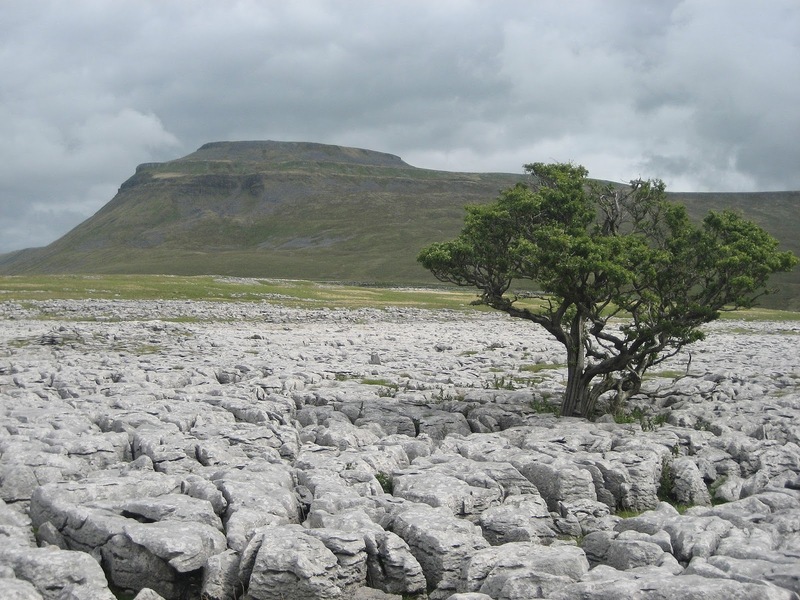 The varying structure of the exposed clints and grykes is known as ‘karren’ (from German) and around Ingleborough the most common example is ‘rundkarren’. Here the clints have been shaped by weathering into rounded crests and contain large, rounded ‘runnels’ or grooves. These features probably formed under the original soil cover and have been modified by sub-aerial erosion (mainly rainfall and surface run off) since the pavements were uncovered. 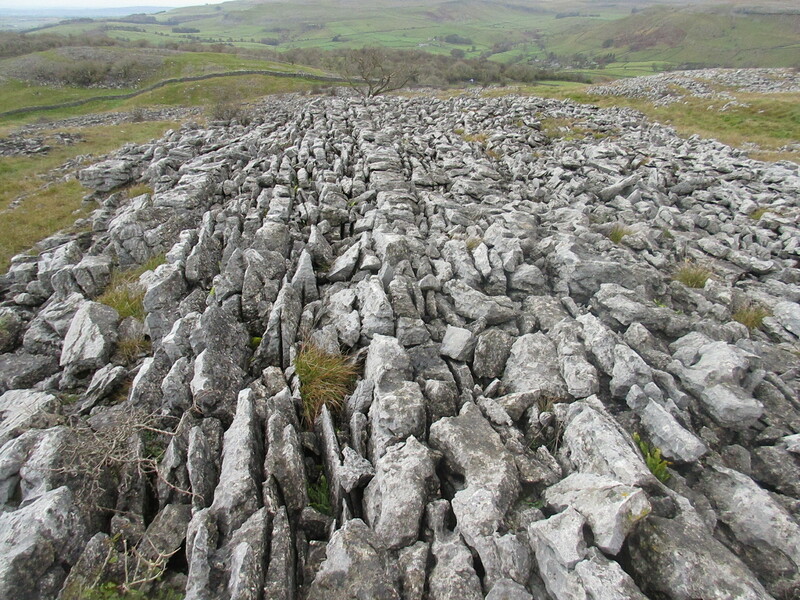 Some of the runnels on the Ingleborough pavements are undercut into the limestone and are wider at the bottom than the top, forming features known as ‘hohlkarren’. They can be over a metre deep. Large wide ‘pans’ can also be seen on the clints, known as ‘kamenitzas’ – whereas ‘pits’ are deeper and narrower at the surface. The inquisitive walker can spend a fascinating day exploring these pavement features without a thought of climbing Ingleborough! The pavements of Scales Moor, on the east side of Chapel-le-Dale, are probably the most impressive of all. Here the clints become progressively larger as we move north away from the Craven Faults, and the whole range of pavement features can be picked out with careful observation. These pavements are also famous for their numerous erratics: boulders of gritstone dumped by the melting ice. Massive isolated boulders of limestone also occur, such as the famous ‘obelisk’. They are likely to have been deposited in a layer of drift which has since been eroded away to leave them exposed as a stark reminder of the power of moving ice. 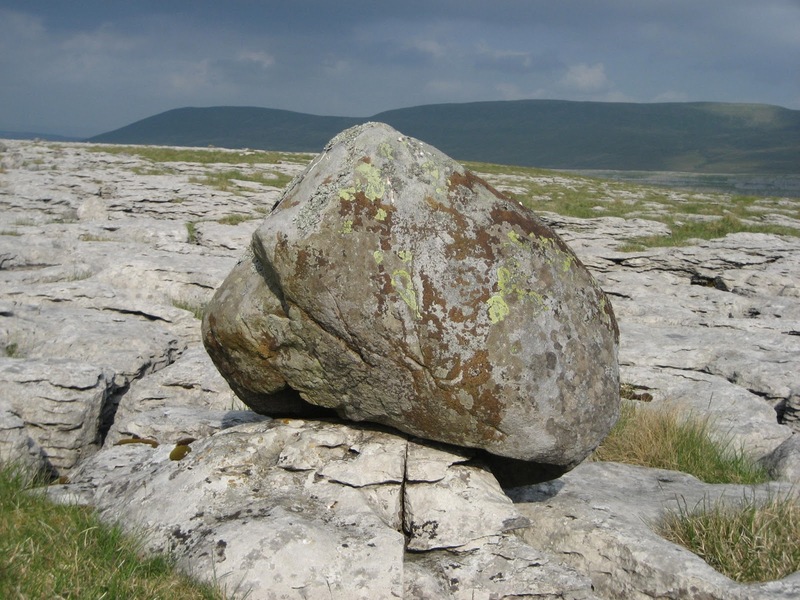 Many fine gritstone examples also exist on the Chapel-le-Dale side, and in Ribblesdale the pavements have a variety of erratics, including those of Silurian origin from the exposed basement inliers. 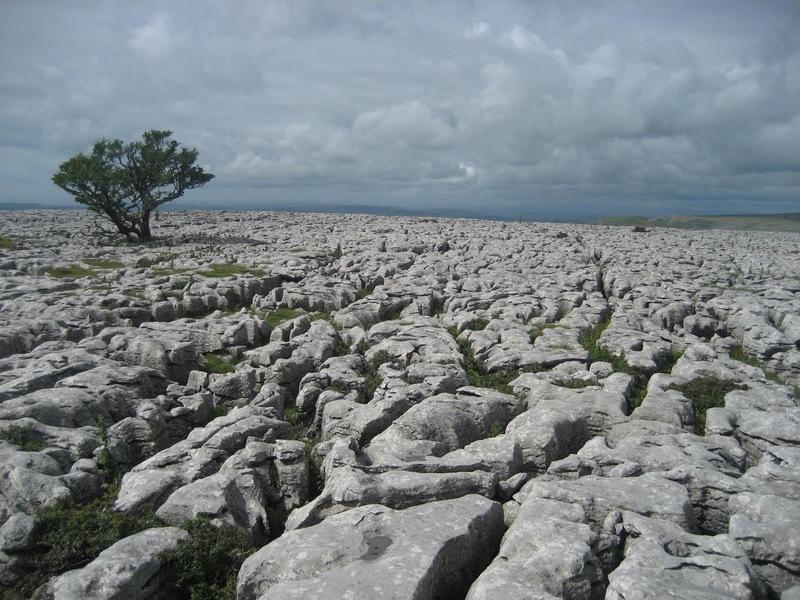 Limestone pavements, once plundered as a source of garden stone, have now been protected for future generations; and rightly so. Not only do the grykes provide unique habitats for rare plants, but the pavements themselves are iconic features of the Dales landscape; as familiar as the grazing sheep and the tumbling waterfall. They are an unforgettable reminder of the power of nature at work.